Two solid decades of dressing the who’s who of the film industry, riding the high wave of fashion for this long, has made Manish Malhotra a doyen of traditional and contemporary styles in India. It is the manner in which he incorporates the best of traditional crafts into his designs to complement the typical Indian look is what makes him the most sought after celebrity designer of the industry. It’s this sentiment that has caught on and is now making Malhotra’s new line called as the Regal Threads, standout amongst a milieu of other designers. It’s a re-look at one of the finest fabrics of India-the Banarasi, and its married this time, with westernized checks and stripes. 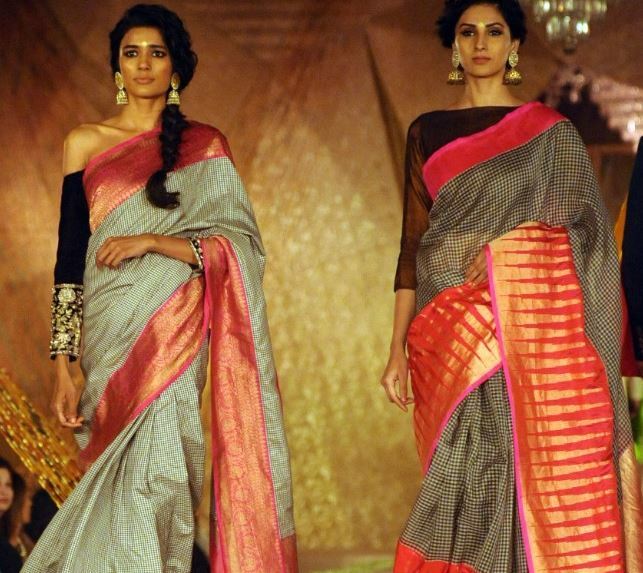 The evolving Indian woman has learnt to make her own choices when it comes to looks and it would be unfair to say that Malhotra has reinvented the saree because the saree remained the much preferred option for most. What Malhotra has done of course is to smartly integrate the urge that women in India have, to experiment with their looks, and yet satiate their inherent Indian nature by adding an element from tradition to each new look. Like in the 2013 runway shows he showcased Phulkari like never before. Now it is the turn of the Benarasi weave and in some of the sarees one cannot help but notice the strong color influences from Upaddas and Kanjeevarams. With social media being powerful as it is, each of his designs are soon picked up by the smaller design houses and we have replicas in the market very soon-they look essentially is the same. 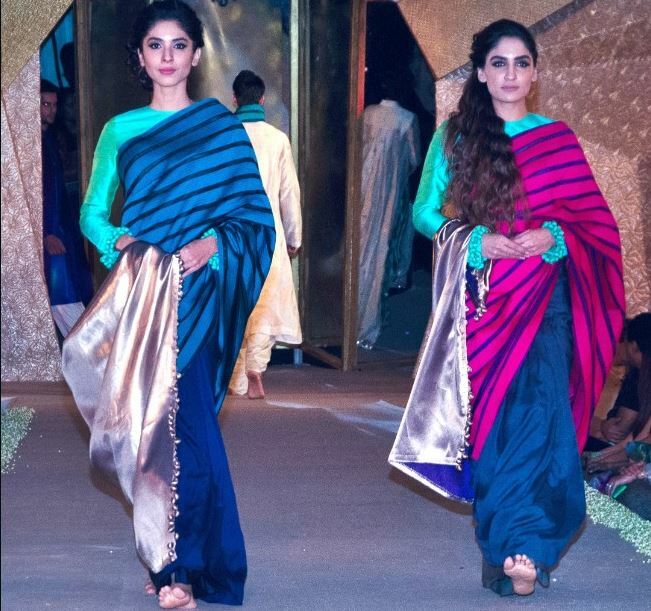 There is undoubtedly deep respect not just for Indian traditional weaving and craft, but also a necessary surge of interest in the saree, that Malhotra has imbued his line of fashion with. He is truly the master of getting to the roots of Indian fashion and creating a new avatar in the true sense of the word. 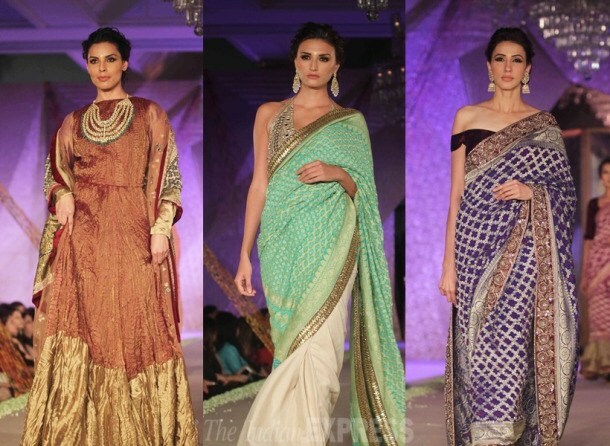 Here are some of his most famed sarees that can make all the difference to one’s looks. The tryst with Benaras continues in this line where he has combined plaid checks with typical heavy boredered Banarasee silk and zari. The boldness of the checks and the colour palettes seem to magically come together even in simple black and white checks with the vermillion zig zag temple border. The boat neck blouse and the off shoulder ones are two ways to create a contrast and give it a further contemporary twist. Not also that, this time Malhotra has kept the border quite broad as compared to many of his previous creations. The Regal Threads line also features the dazzling pallu typical of Benarasees and here one can see the bold usage of stripes like never before. The half and half concept continues, with turquoise border in silk and the rest of the saree in royal blue, and magenta and black stripes. The vividness of the colour palette is extremely Indian in every sense. Note the demure round necked blouses and the ruffled long sleeves. An ode to the bright palettes on Indian sarees-this mulicoloured checked silk has been given the Banarasse treatment through its rich traditonal border, but what makes it worth its weight in gold is the blouse in brocade. 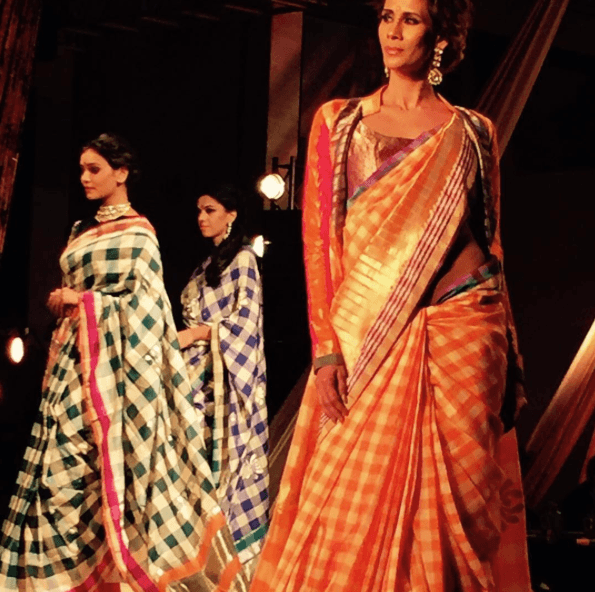 The saga with traditional silk continues preparing the season’s hottest takeaway was the usage of muted orange-beige, bottle green and navy checks that only Malhotra could have so inventively used with rich brocade. There is something about the boldness of these plaid checks that enhances the beauty of the fine weave. The usage also of temple border and simple stripes makes for an interesting highlight. Note the jacket blouse that is worn atop the brocade one. Manish Malhotra also has a penchant for making the diva look so popular with the usage of shimmery fabrics, chiffons, crepes and dual toned dyes for effect. Here the gorgeous model is wearing a creation that showcases the allure of soft peach pink and the magic of crystal coming together. Note the usage of border which is woven and attached to the saree-the color is not contrasting but simply layering one on the other to create a subtle drama. A golden saree in a shimmery crepe that almost looks like satin has been given the brocade treatment along the borders. The way the border and the base color blend in is also trademark Malhotra-same yet not similar-coming together with distinctly visible elements. The crochet blouse ads that lightness to the look that could have gotten a bit too heavy. The pretty mirror work along the border is also stunning in its simplicity. Here is another beauty in a lighter beige but this time Malhotra uses mirror work border with a stunning contrast embroidery along the lower portion of the saree helping it get all the attention in a palette this light and airy. The thread work embroidery flares out with each step one takes. The love for shimmer never seem to be satiated as Malhotra loves the kook of sheer fabric and the sizzle of mukaish and crystal. In this case the border work is outstanding in terms of embroidery, the panel work and the way despite being a white on white creation, it does not lack in subtle contrast in design details. The hot pink embroidery getting offset in muted gray green, and the shimmery underskirt, that is making the net saree sizzle with a different kind of fire. A favorite with Malhotra-his net sarees have endured and evolved each year with a different kind of look. The peach and pink diva look emboldened in a shimmery border with detailing of gota. The muted yellow along the lower border is what instantly catches the eye and sets the saree apart as a Malhotra creation. Another sheer saree with bold royal blue with gota trim in zardozi style. 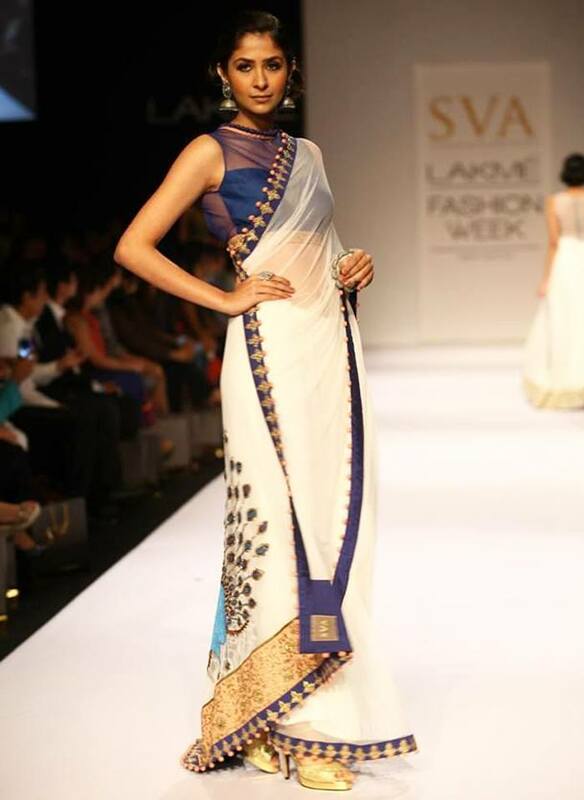 The pallu is where the saree comes alive in its look-the peacock motif on white is simply ethereal. Note the usage of thin border all along the length of the saree and the broader one at the pallu to make it appear heavier. The boldness of red on red, the latkans all along the pallu is all that makes this creation so divine. The definitive embroidered saree-for those wary of large motifs here is a Malhotra creation that has used perhaps the largest floral design possible-an absolute riveting composition that is best worn with a halter neck blouse to tone down the dense design. And finally the last one I would like to showcase is the ode to Benaras-the two sarees very heritage kind in its look but made contemporary with the change in the blouse and the usage of half and half style .